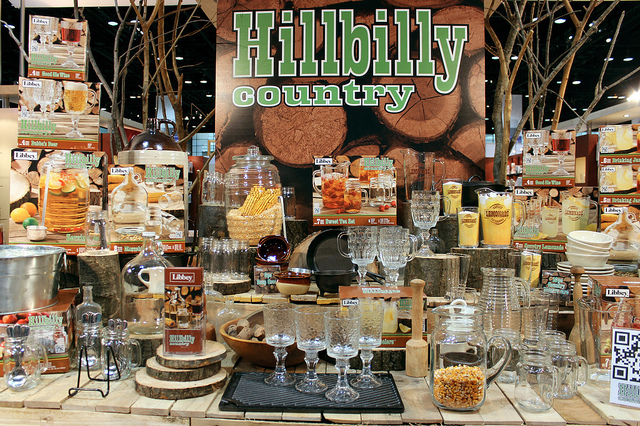 "Newstalgic" and "Hillbilly country" were among the hot trends at the 2013 International Home + Housewares Show, which wrapped Tuesday in Chicago. With billions of dollars at stake, over 2,100 exhibitors from 34 countries took over McCormick Place for four days to showcase their products to 20,000 buyers from over 100 countries — which they all hope we&apos;ll buy for our homes soon. Aladdin&apos;s newstalgic insulated Mason tumbler was the most coveted swag this year. BPA-free in vintage blue with a steel lid and extra-wide smoothie straw, it&apos;s a modern reinvention of the DIY glass jar tumbler projects as seen on Etsy and Pinterest. 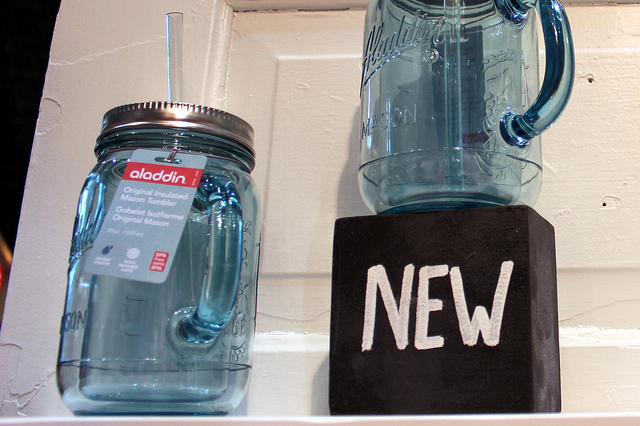 DIY soda makers were among the hottest gadgets, with SodaStream as the leading brand. They debuted a new designer model, SOURCE, by Yves Béhar. SodaStream recently announced a new nearly $4,000 Samsung collaboration refrigerator, with soda water dispenser. The New Yorker featured an article recently, "Should Coke and Pepsi be Worried About SodaStream?" Answer: Yes. I&apos;ll have a product review on soda makers soon. Full disclosure: I was the guest chef again at the iSi booth, makers of the classic, iconic soda siphons as well as cream whippers, seen at Starbucks and beyond. El Bulli chef/owner Ferran Adrià used iSi whippers to make his infamous foams, the world&apos;s first taste of modernist cuisine. Chef David Chang, owner of the Momofuku empire predicts the whippers will become best known for batters over the next 10 years. 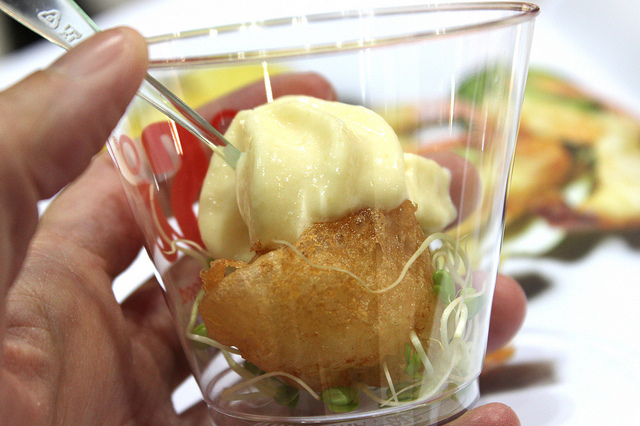 One of the tastings I made was carbonated tempura batter shrimp, served with mango coconut yogurt foam, on lentil sprouts. Next door at the Libbey glass booth, they also featured hillybilly country pieces in heavy glass jars plus moonshine jugs. 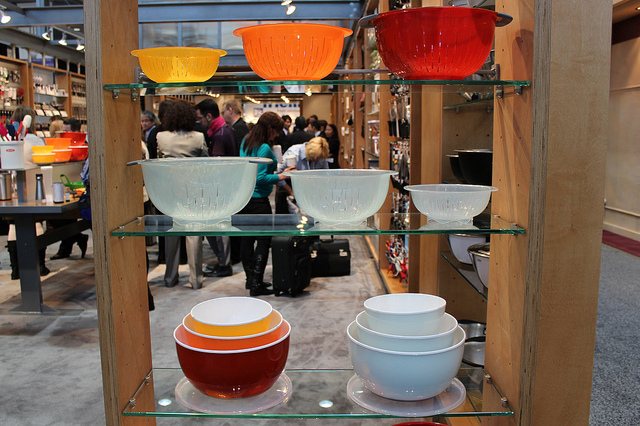 At the OXO booth, which always stands at the gateway to the Dine + Design Expo, they chose their new colander and bowl with lid to place front and center, among dozens of new products. 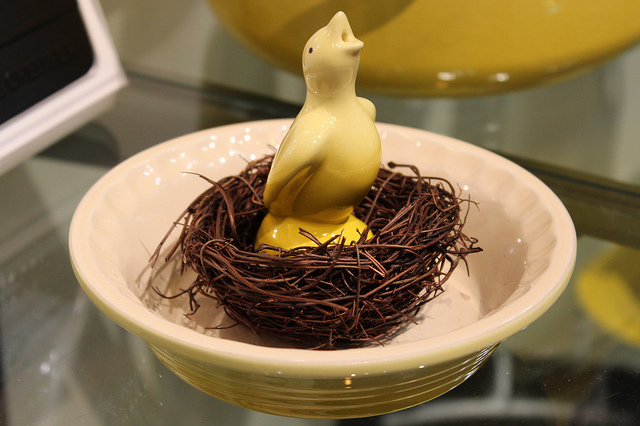 Le Creuset&apos;s new color, sunny yellow Le Soleil, included an adorable pie bird in the classic shape of a little singing bird, originally designed to vent steam from pies. 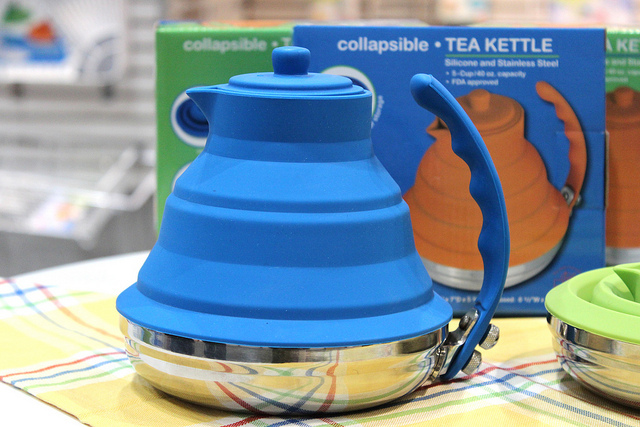 Among the many odd-to-me products was the collapsible silicone and stainless steel tea kettle by Better Housewares, but there must be a demand because there&apos;s also a similar product on the market, the SlickBoil by Cuissential. 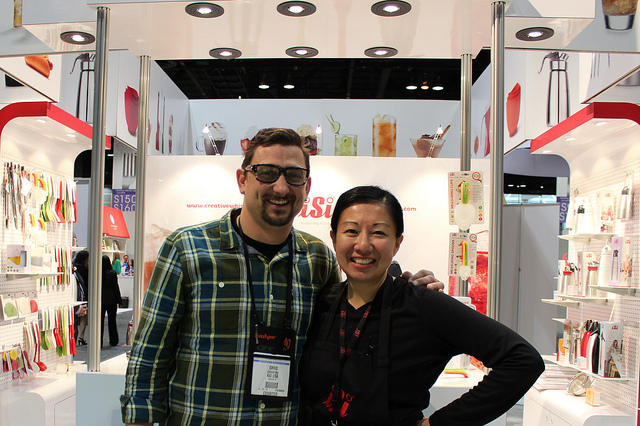 While I hardly had a chance to leave my booth this year, Top Chef Masters winner Chris Cosentino stopped by for a visit. Chef/owner of Incanto in San Francisco, he&apos;s also the brand ambassador for Shun Cutlery. Best known for gutsy dishes as seen on his site Offal Good, Cosentino joined the many celebrity chefs at the show, including Guy Fieri and Paula Deen, and real chefs Rick Bayless and Stephanie Izard. With so much at stake, for a working chef a hot product could indeed be awfully good. Find me on Twitter at @louisachu.